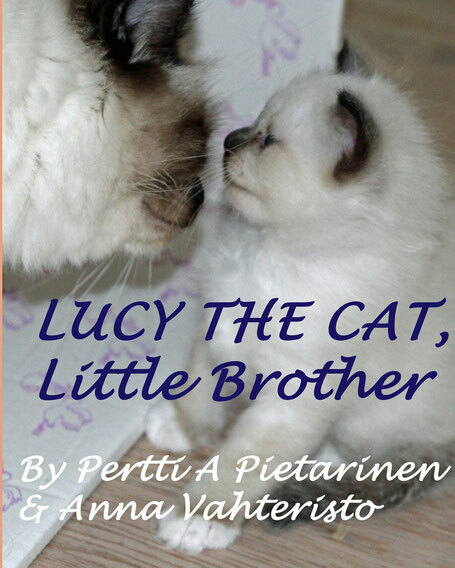 Lucy The Cat: Little Brother (ISBN 978-1500770396) is the second book in the award winning Lucy The Cat series, the charming story about Lucy, the curious, cute Sacred Birman cat. This time Lucy tells about her little brother Cristiano. You will meet Cristiano already when he was only a few days old. You will see how Cristiano learns many new things during his first few weeks. Will Cristiano become the best soccer player or the world’s strongest cat? But first he needs to learn to take care of himself. Of course mama cat helps and teaches him. You will learn that young kitten’s life is full of surprises and funny things. Lucy is the expert to tell the story because she is a cat, too. Humans have sometimes challenges to understand cats’ inner life. Therefore it is better to have a real expert’s view, Lucy The Cat's view. Especially Children and cat lovers will enjoy beautiful pictures and engaging charming stories. Lucy The Cat loves her brother, because he is a perfect, purrfect kitten. From Amazon Review: "Lucy the Cat is a real storyteller, I love her very much. The book Lucy The Cat: Little brother is the second book in the series. This time miss Lucy tells about her little brother Cristiano, who is so cute and has great dreams. Lucy’s wonderful engaging, dialogue-styled narratives are real joy to read to your child. You feel like having a conversation with Lucy, because she asks many questions to serve as discussion topics with children - and why not even with older readers. The pictures are absolutely charming!...."